Disruptive ideas usually don’t see light of day at large companies. And when they do, it’s not for long. This is because traditional financial metrics such as NPV, IRR and RoNA are used as measures of success. In addition, the allocation of capital for new ideas hinges on business cases that ask us to forecast indicators such as the target market, the market size, the payback period and aforementioned financial metrics - all factors that can’t be reliably predicted when it comes to disruptive innovation which is inherently uncertain and chaotic. 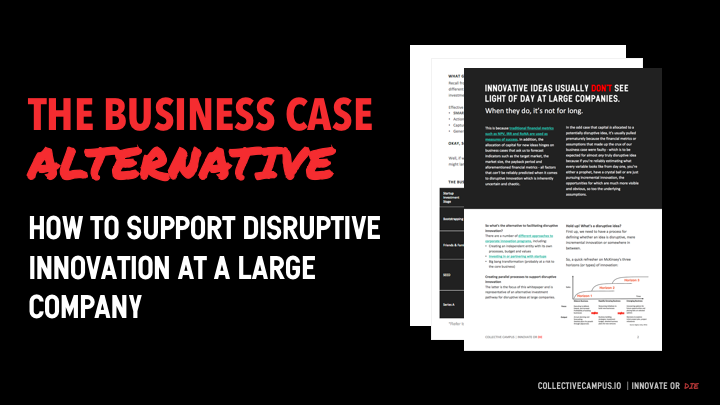 Download our ebook to discover an alternative approach to traditional business cases to successfully empower your people to experiment with new ideas and take a metered-funding approach to corporate innovation. "Collective Campus team have been instrumental in guiding us with 'ahead of the curve' innovation techniques. Their insights have been essential for staying relevant in the face of digital disruption and making strategic moves before our competitors do." Thanks! You'll be receiving an email shortly. Thanks! Click below to access your tool if it doesn't automatically open in a new tab. Thanks! Your file is currently being downloaded. If you experience any issues, click below to download manually. Something went wrong... hit that sign up button again!